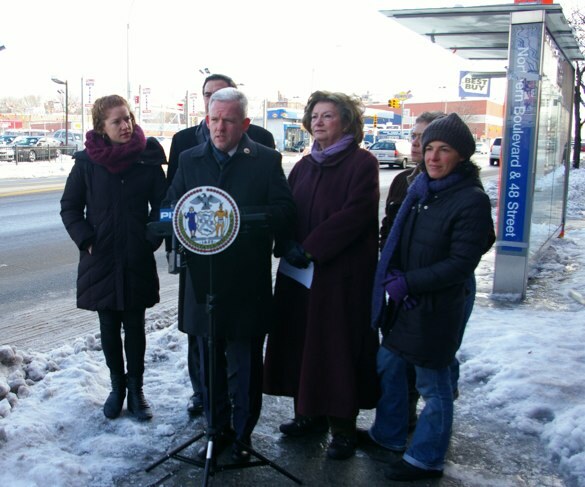 City Council Member Jimmy Van Bramer, state electeds, and advocates gathered in Queens this morning to call on Mayor Bill de Blasio to make Northern Boulevard a Vision Zero priority by making hazardous intersections safer for pedestrians. Standing next to a recently repaired bus shelter at Northern and 48th Street, which was nearly destroyed by a curb-jumping hit-and-run driver who seriously injured five people on February 1, Van Bramer also singled out dangerous crossings at Northern and 42nd Street, 43rd Street, 52nd Street, and 62nd Street, where 8-year-old Noshat Nahian was killed by an unlicensed truck driver. “We’re asking the administration today to include this series of intersections on Northern Boulevard so that no child is ever killed trying to cross the street to go to school, that no 7-year-old girl is ever sent to Elmhurst Hospital waiting for a bus, or excited to have just come out of Old Navy with some new clothes,” said Van Bramer, referring to Nahian and one of the victims struck last weekend. De Blasio has said he wants to revamp at least 50 corridors and intersections a year, but has not yet announced where the first round of improvements will take place. Van Bramer said the administration has asked for recommendations from council members. De Blasio has also directed the city’s police, transportation, taxi, and health commissioners to produce a pedestrian safety plan by February 15. De Blasio’s Vision Zero launch event was held at PS 152, where Nahian attended school. Northern Boulevard is a hostile, wide street lined with retail and grocery stores. Throughout today’s street safety presser, speakers were drowned out or interrupted by loud trucks and honking motorists, who whipped by just a few feet away. Van Bramer cited a report from the Tri-State Transportation Campaign that found that five pedestrians were killed on the boulevard from 2010 to 2012. That number does not include Nahian or Olvin Jahir Figueroa, age 3, who was hit by an alleged drunk driver while crossing with his mother at Northern and Junction Boulevard in 2013. Since 2011, NYPD data reports put the number of pedestrians injured by drivers on Northern Boulevard in the hundreds. “As we often say, ‘It is too late to wait,'” said Van Bramer. “The time to act is now.” Van Bramer said he has a “pretty extensive list” of streets targeted for improvement in his district, and would make it available to the public soon. “There are far more than 50 [intersections] that deserve this recognition,” he said. Van Bramer was joined by state Senator Michael Gianaris, Assembly Member Marge Markey, and representatives from Transportation Alternatives and Make Queens Safer. Citing the deaths of Nahian and Angela Hurtado, Gianaris noted his bill to make it a class E felony to cause serious injury or death while driving without a valid license, if the license was suspended or revoked for traffic offenses. Markey sponsors the Assembly version, which right now has just one co-sponsor, Joe Lentol. “These are people that know they shouldn’t be on the road,” Gianaris said. He lauded de Blasio for embarking on Vision Zero, and said he considers toughening penalties on unlicensed drivers part of the effort. “These incidents keep on happening because the issue of pedestrian safety has not been taken seriously enough,” Gianaris said. The dangerous five-legged intersection of Northern Boulevard, 34th Avenue, and 48th Street has a new pedestrian island, sidewalk extension, and crosswalks. Transportation Commissioner Polly Trottenberg joined Council Member Jimmy Van Bramer on Friday to unveil the improvements. Activists offer many possible solutions, begging the city to act boldly. After two crashes in ten days at the same Sunnyside intersection left one cyclist dead and another in critical condition, Council Member Jimmy Van Bramer is calling on DOT to take immediate action and install a protected bike lane on 43rd Avenue between Queens Boulevard and Roosevelt Avenue.